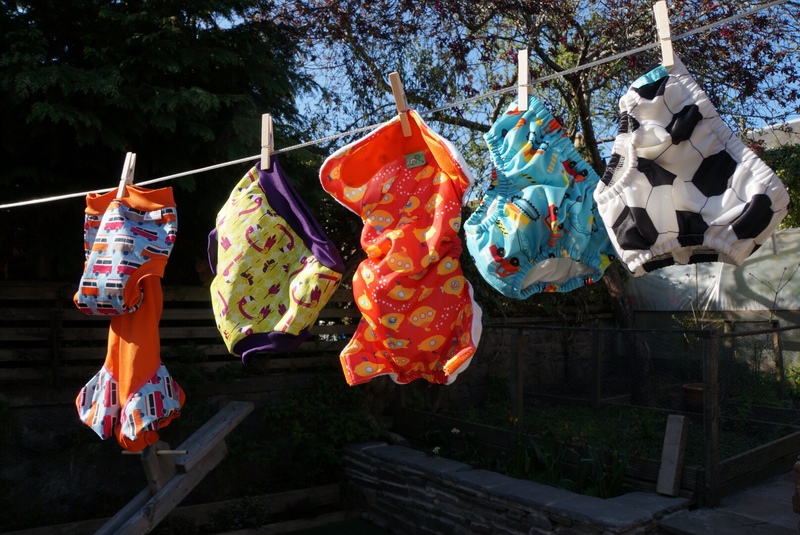 Reusable swim nappies are one more way to avoid single use plastic and ditch the disposables. I personally find cloth nappies much easier to use than disposables. Swim nappies are no different. I first looked into them as I was quite surprised how expensive disposable swim nappies were when I first took my eldest into the pool. The pool I went to also insisted I used 2 at a time so I had to double them up, which just seemed bonkers and the disposable packs available are quite small. Reusable swim nappies are budget friendly and come in far prettier prints! I appear to have accidentally developed a bit of a penchant for swim nappies of late and have a mini stash going on. It is nice to have the option though so I’m not feeling too guilty about it! Now I was lucky enough to get sent these beauties to try. The prints are super cute and the vehicle print nappy actually doubles as a toilet training nappy. This is very handy. I am all for a multi-purpose nappy! Both have these have had a thorough testing in the pool, around the house and anything that involves playing with water, inside and out. They’re fab wee nappies. The fit is similar to children’s underwear, think briefs! There is elastic around each leg and at the rear of the nappy. Perfect for keeping any poop explosions contained! There is a functional drawstring on both of them as well which is great for making sure everything is nice and snug. Two for one with this nappy. Perfect budget option, in a gorgeous print too! This is a fab option if you don’t swim often or need a simpler nappy system for water play in the home or garden. It’s great as a toilet training nappy as there is an absorbent core. This means it’ll contain most of an accident but will still let your toddler know when they’re wet. Loki has had a good test of this one in the house when we play with water and you could literally see the cogs turning when he’d done a wee because he could feel it. I think when he’s ready to toilet train this nappy will be perfect to use. I got a matching wet bag with this one and it’s perfect for cloth wipes or muff fluff. I’ve claimed it for myself, although it’d definitely be great for taking swimming and stashing wet trunks in! Aside from the different print, this is pretty much the same as the other Charlie Banana print but the lining is Tencel. Even without the extra absorbent core the Tencel layer is still pretty fab so would work well as a training pant too. These nappies have a lovely fit, wash really well and are soft inside on the skin. I’m a huge fan of Pop In cloth nappies and the prints are fab. The quality is unquestionable and I’ve never worried whether or not they’d do the job. I got Loki the swim nappy and rash vest set last year ahead of our holiday and it was great. The nappy is a nice snug fit (which is what you want in a swim nappy) and the rash vest kept Loki’s skin protected. The inner layer of the nappy is fleece and the clever bands on the legs and waist ensures no poo escapes while you’re having fun in the water. The sizing for Close Parent swim stuff is slightly questionable. Size up. Twice if you can! Also insanely long labels? I don’t quite understand why but they’re easily removed! I couldn’t resist the flamingo print when it was released so I got Loki the next size up. It’s significantly bigger than last year’s set which is a bonus! Don’t forget a liner for this one as pulling down a tight fitting nappy filled with poo is fun for absolutely no one! This was the first brand of nappy I ever purchased all the way back in 2010. I used to use the old style peenut wraps (they used to be called flexi wraps) in the pool over a disposable to comply with the “twice the waste” disposable nappy recommendation! The prints are amazing on this one. Also this one is unlike all the others as it has a beautiful soft layer of fleece. With it being a wrap instead of a pull on nappy it offers a much more tailored fit, which is great. It’s so handy to comply with the double swim nappy system most pools request you adhere to. For the swimming pool my favourite is the Charlie Banana nappy with a Tots Bots Swim Wrap over the top. At home playing with water in the garden and the house is the Charlie Banana trunks hands down. So soft and comfy! For the Beach and outdoor water play definitely the Close Parent one. It’s a bit more robust in terms of thickness of fabric and the fit offers a bit more coverage which is great for outside. In short I appear to have accidentally justified my entire stash so I’m happy with that at least! All 3 of these brands wash well, fit well and are a great cheaper alternative to expensive disposables you wear once and throw away! Here is the link to Charlie Banana, they stock a lovely range of prints and you can find Tots Bots and Close Parent Swim nappies at Babipur.